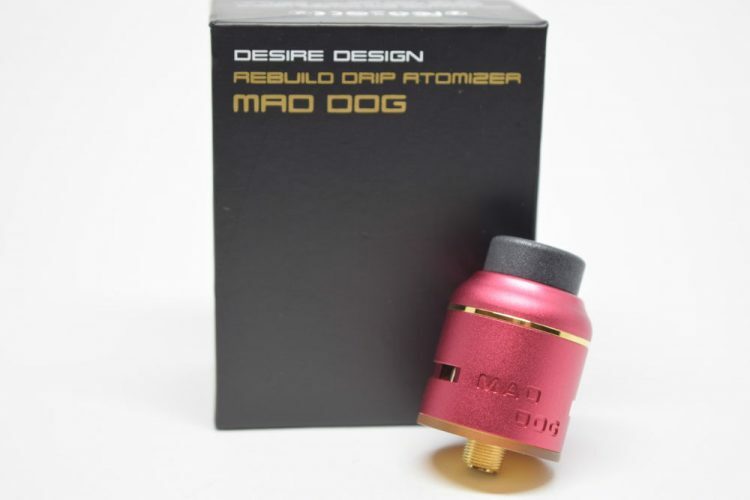 The original Mad Dog RDA was one of the sleeper hits of last year, gaining a lot of popularity within the vaping community even without any sort of real promotion from Desire, a relatively unknown Chinese manufacturer. Thanks to its above-average performance and attractive price, the Mad Dog RDA sold pretty good, or t least well enough for Desire to come out with a version 2, which features a a few design tweaks as well as compatibility with Innokin’s LIFT Syphon Tank Adapter, an innovative system that turns the RDA into an RDTA. 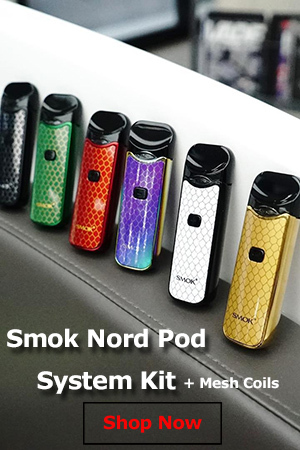 The Mad Dog V2 comes in a simple, black cardboard box with the name of the atomizer and the “V2” logo on the front and a list of kit contents on the back. On the sides of the box, you have the company information and three pictograms of the atomizer deck with the three included types of screws. Inside the box, we have the Mad Dog V2 buried in a huge piece of Styrofoam, an Allen key, some o-rings, 8 extra post screws and a hollow connection pin for squonking. That last one is a pleasant surprise, although with squonk mods becoming so popular these days, I guess it was just a matter of time until manufacturers started making their RDAs squonking-ready right out of the box. 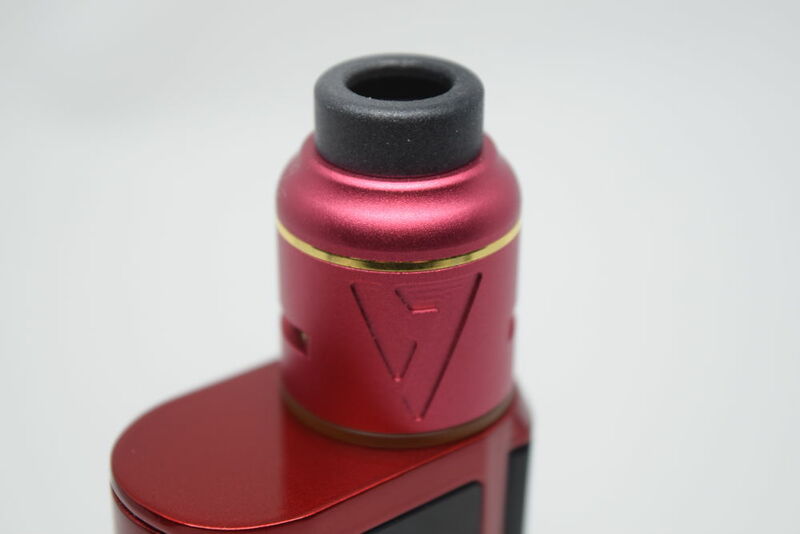 In terms of design, the V2 is actually quite different than the original Desire Mad Dog RDA. 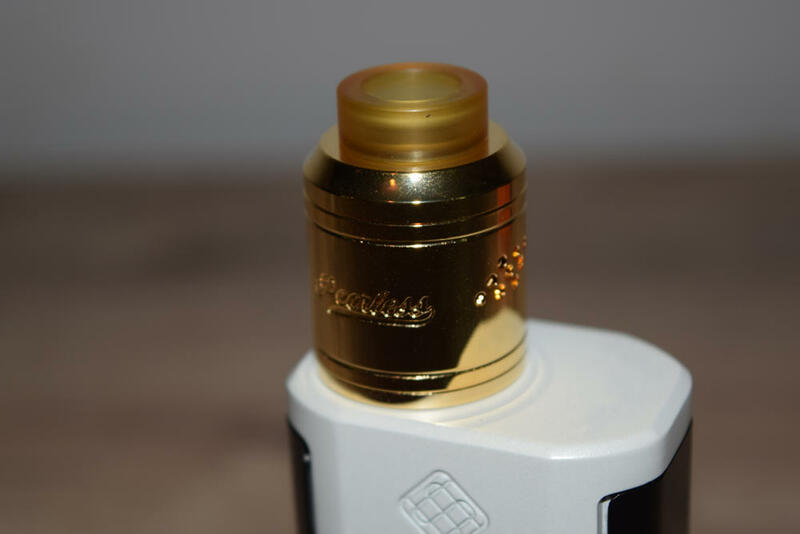 The barrel is a bit more rounded at the top this time around and features a gold-plated ring, the “Mad Dog” logo is different as well, and the drip tip is no longer Ultem, but a different plastic material that I am not familiar with. On the inside, the deck now features staggered posts, but other than that, everything is very similar to the original Mad Dog. The well is just as deep, the airflow slot slits are still angled to push the air underneath the coil and improve the flavor, and the deck posts feature the same three types of screws as the first Mad Dog edition – flat head, Philips-head and grub screws. You can use whichever ones you like, and they are all included in the kit. 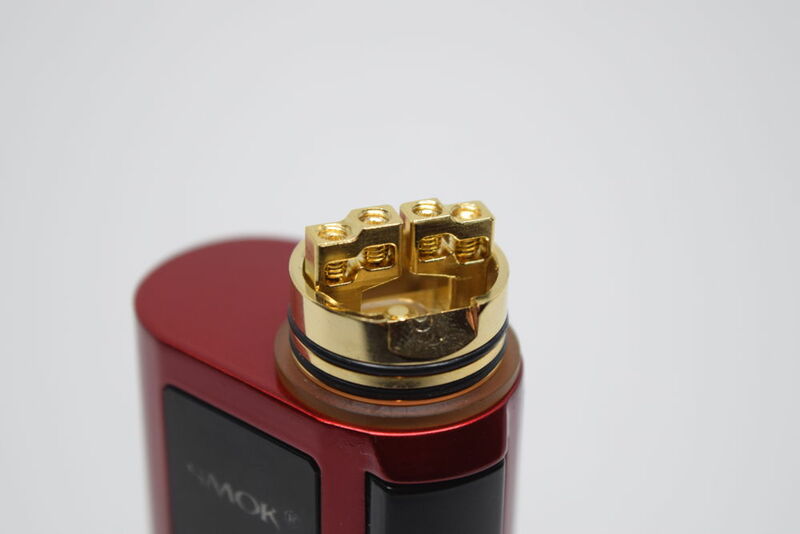 Mad Dog RDA V2 is 24 mm in diameter, just like the original version, and features an Ultem base plate that prevents the heat from the atomizer from reaching the mod underneath, but also makes scratching the mod by screwing the atomizer on too tight a non-issue. 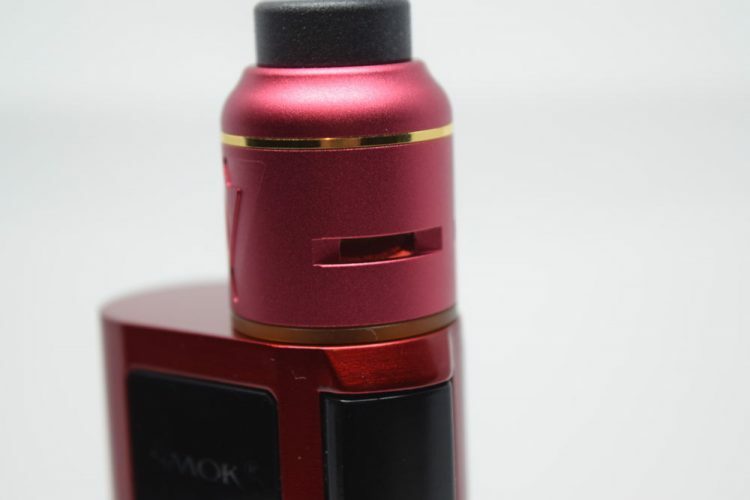 It doesn’t affect the look of the atomizer at all, and you’ll want to use it because the Mad Dog V2 has such a long 510 thread that it probably won’t sit flush on most mods if you don’t. 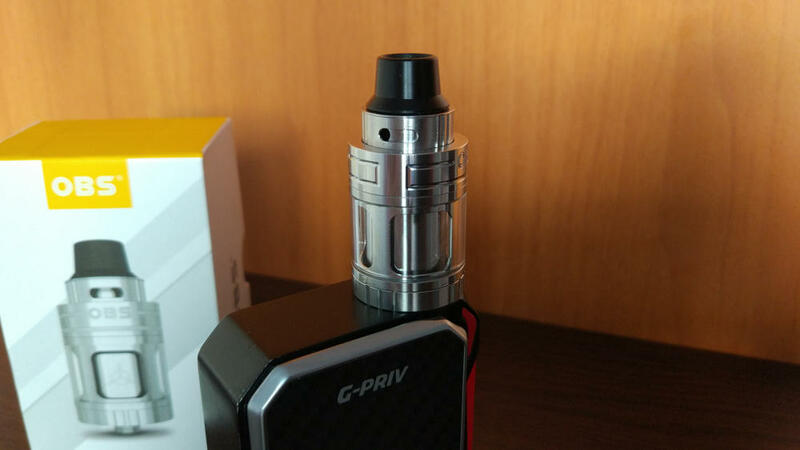 I am not a big fan of the new drip tip Desire used on the V2. 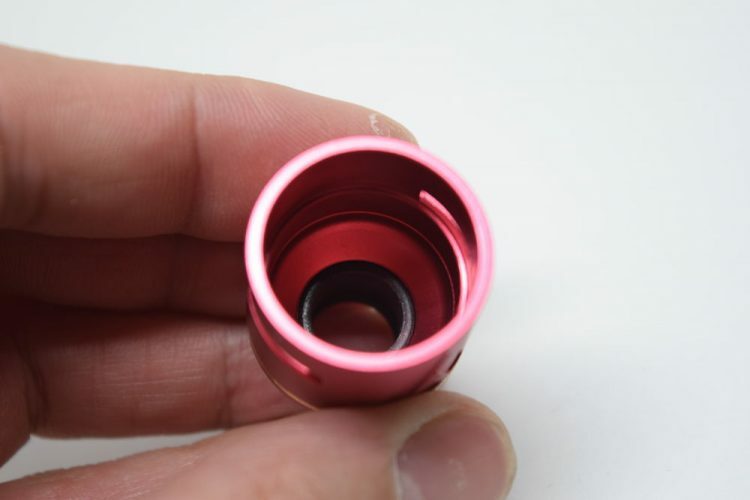 It’s an 810, Goon-style tip, but’s it’s certainly not the best drip tip I’ve seen, quite the opposite. I don’t know what material it’s made of, just that it’s certainly not Delrin or Ultem. It’s a very light plastic material that has a very cheap feel to it. The dip does a good job of insulating your lips from the heated metal components, but in terms of aestehtics, it leaves a lot to be desired. The barrel of the Mad-Dog is a one-piece, so even though that gold rings appears to be a separator between the top cap and the barrel, its purpose is merely decorative. That’s not a big issue though, as the drip tip is large enough to drip straight through, and the o-rings on the base do a good job of preventing the barrel from turning accidentally. One thing I’m not particularly a fan of is that Desired used aluminum alloy for the barrel, instead of stainless steel. It doesn’t look or feel bad at all, and I’m sure it helped bring down the price of the RDA, but I just think aluminum is the safest material, at least as far as vaping goes. It’s a personal opinion, so consider this a subjective con. 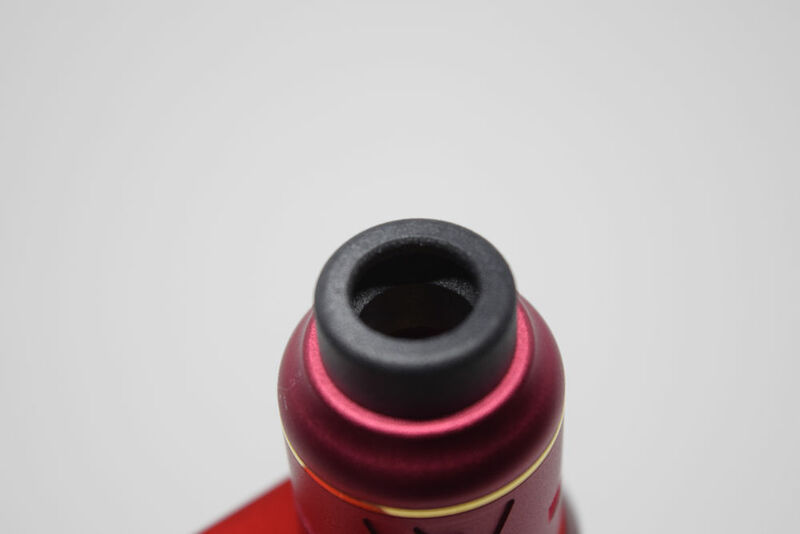 Tha Mad Dog V2 features two large side airflow holes that can be gradually open or closed by turning the atomizer barrel. Unfortunately, there is no way to close just one of the air holes for single coil vaping, and the kid does not include a plug. Basically, it can only be used effectively in dual-coil mode. 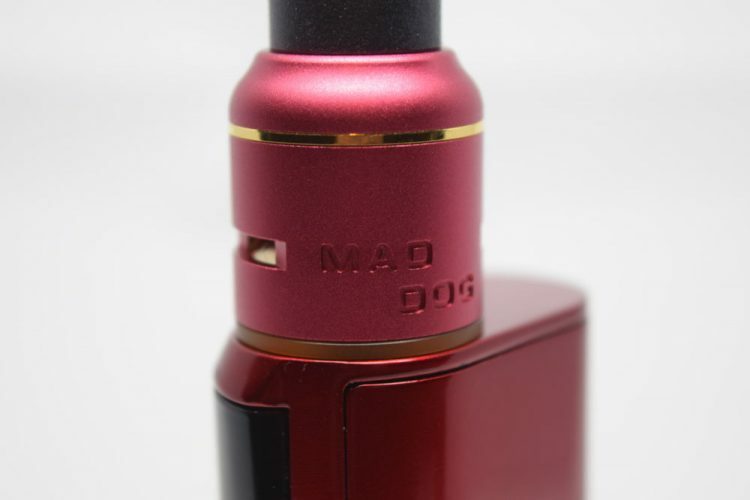 One thing I would like to add about the looks of the Mad Dog RDA V2 is the change of font for the “Mad Dog” logo. The original featured a cool hand-written font, but for some reason, Desire went with a generic one on the V2. It just looks boring, in my opinion. They also added their company logo which I guess should be a combination between a ‘D’ and a ‘V’ – as in ‘DesireVape’. All in all, I wish they had stuck withe the original logo. The deck of the Mad Dog V2 looks very impressive. Everything, from the posts to the screws and even the juice-well is gold-plated for improved conductivity, and the massive post holes can accommodate pretty much any type of wire. 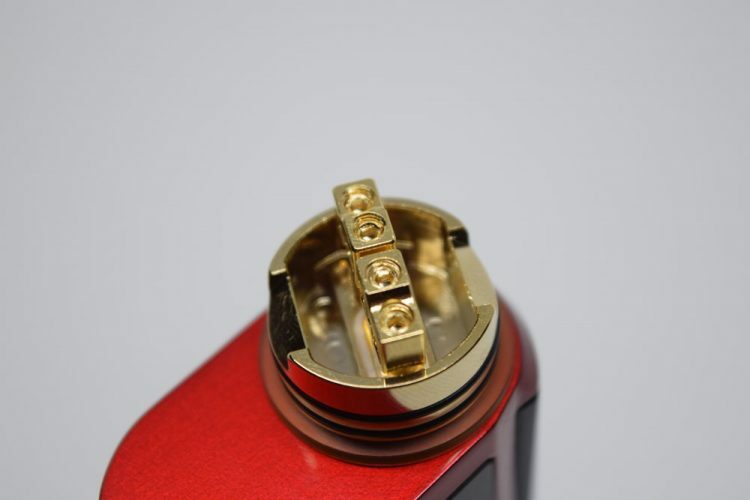 The staggered design of the posts is supposed to make installing your coils even easier than on the original Mad Dog RDA, and the vertical clamp style prevents flat wires from twisting when you tighten the screws. As I mentioned in the beginning, the Mad Dog RDA v2 comes with three types of screws, so you just have to choose the ones you are most comfortable with. They all work great, in my opinion. 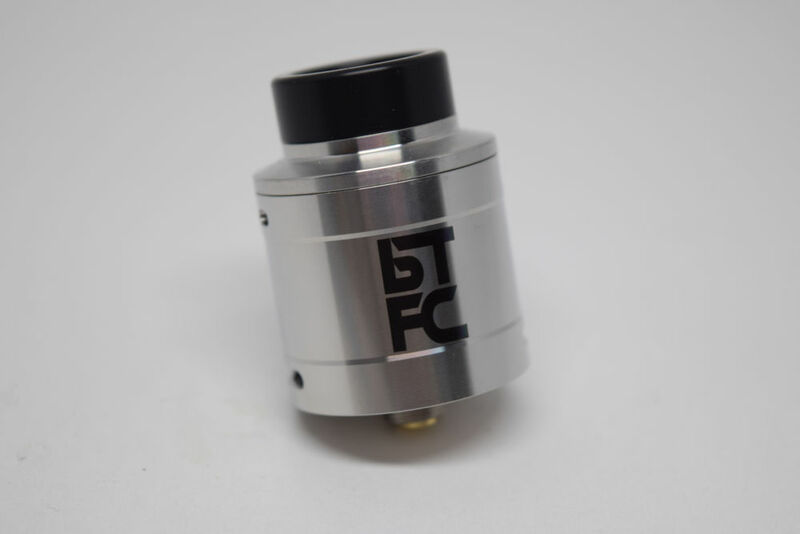 The juice well on this RDA is simply massive, and both sides communicate through a large channel between the posts. That means you can simply drip in the middle of the deck, through the drip tip, and the e-liquid will easily reach both your wicks. You can overdo it with the dripping, as the diagonal slits in the side of the deck prevent the juice from leaking out through the air holes. The original Mad Dog didn’t have the best build quality either, but people liked it because for a cheap RDA it had above average-performance. After playing with the V2 for a couple of weeks, I can confirm that the same is true for the second iteration. Desire kept most of the main features of the Mad Dog, making only small changes, like the staggered design of the posts, so the overall vaping experience is very similar. In my opinion, the Mad Dog V2 strikes a fine balance between vapor production and flavor intensity. 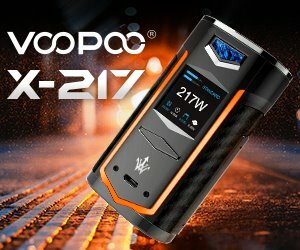 It may not be a cloudchaser’s dream atomizer, but for the vast majority of vapers, this thing chugs vapor, especially with both airflow holes wide open. That’s a bit too airy for my taste, though, so I prefer to keep them only halfway open, which I found also enhances the flavor. In terms of flavor, the Mad Dog V2 was a very pleasant surprise. The angled design of the airflow slits make a world of difference, as they direct the air towards the bottom of the coil and push the vapor straight up into your mouth. At least I assume that’s why the flavor I get from this RDA is so freaking great. My only major gripe with this atomizer, at least in terms of vaping, is that there is no single-coil option. I guess most people nowadays use RDAs in dual-coil mode, but when I have beefy, low resistance coils and don’t want to go down too low on the Ohms scale, vaping in single-coil mode is an option I like to have available. If that’s not an issue for you though, and are looking for a good RDA at a great price, the Mad Dog V2 will not disappoint. The Mad Dog RDA V2 is definitely not the best atomizer money can buy, but if you’re looking for above-average performance at an affordable price, it’s a great choice. Heaven Gifts has it in stock right now for just $29.90.